If there is a limit to human expression the arts come probably as close to the edge as any. And among the edgier ones is photography pursued by Bill Schaum for more than 40 years and sculpting by his son, Shipman. 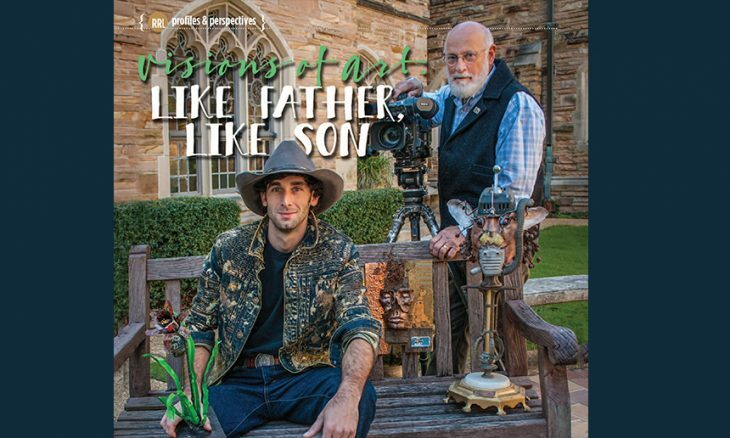 From the year he won an award at the age of 14 for a piece of sculpture, he’s been living the life of an artist creating extraordinary work often from tangled masses of junk.. “He’s a perfectionist,” his father says. “No matter how long it takes, the sculpture has to be perfect before his name goes on it.” Although the sculptor usually works with metal, he also has to include wood, bone and glass in listing his materials. Unfortunately, he does not accept Michaelangelo’s statement about sculpture that the figure you are carving waiting there in the stone and all you have to do is chip away the excess marble to release the person within. Usually, Shipman has to weld, forge, solder and hand paint his work to resemble natural or futuristic life. There may also be another reason. Since most sculptors are men Shipman is probably right that sometimes a man’s testosterone just makes him want to grab a hammer and slam into something. And if that slamming “done just right turns into a beautiful piece of art, who can object?” To see his work… www.shipmansart.com, Instagram: Shipmansart, or by phone: 334.467.3074. Bill Schaum has been involved with video and still photography for more than forty years. Even so, as he says, “you never know it all. That’s what makes it so fascinating. Every day is another discovery.” His father was an amateur photographer and hooked Bill while he was still too little to resist. With the first pictures he was permanently mesmerized, an enchantment which has only grown with the years. Throughout his career Bill has been fortunate to have shuffled off, not just this mortal coil, but the chains of Montgomery’s provincialism. Working steadily, he has wandered the world, exploring one remote venue after another. Camera at the ready, he has flown over the Great Wall of China in a Russian helicopter, walked in Tiananmin Square, watched the sunrise along the Amazon in Brazil, dined in the Great Hall in the Forbidden City, and interviewed big and little people in the Civil Rights Movement. Now he is working mainly in video, and is planning two documentaries. One, the in-depth story of the Blount Cultual Park, and the other, the history of Montgomery. In the meantime, he is waiting for invitations to speak to high school and college classes about the ins and outs of photography. He loves to discuss his profession and now searches for the answer to a frequently asked question, what makes a great photograph? What is it about two iconic pictures, the one of Marilyn Monroe standing on the street grating with her skirt blowing up, and the other, the girl from Afghanistan with the startling green eyes which appeared on the cover of the National Geographic some months ago? “Well, of course it’s a matter of angle and especially of light, but more important than that, it’s what the viewer brings to the viewing. If it moves you emotionally, if it says something, anything, to you, then that photograph has meaning and depth to you. And every photographer knows that you never take the perfect picture. There’s always something you should — or should not — have done. So that’s why it’s so endlessly fascinating. You’re always searching for the next improvement.” Contact Bill at: Bill Schaum Video Productions: 334.264.2400.